For other treaties with this name, see Treaty of Saint-Germain-en-Laye. Ratification by Austria and four Principal Allied Powers. The Treaty of Saint-Germain-en-Laye was signed on 10 September 1919 by the victorious Allies of World War I on the one hand and by the Republic of German-Austria on the other. Like the Treaty of Trianon with Hungary and the Treaty of Versailles with Germany, it contained the Covenant of the League of Nations and as a result was not ratified by the United States but was followed by the US–Austrian Peace Treaty of 1921. The treaty signing ceremony took place at the Château de Saint-Germain-en-Laye. Already on 21 October 1918, 208 German-speaking delegates of the Austrian Imperial Council had convened in a "provisional national assembly of German-Austria" at the Lower Austrian Landtag. While the collapse of the Austro-Hungarian Army culminated at the Battle of Vittorio Veneto, the Social Democrat Karl Renner was elected German-Austrian State Chancellor on 30 October. In the course of the Aster Revolution on 31 October, the newly established People's Republic of Hungary under Minister President Mihály Károlyi declared the real union with Austria terminated. With the Armistice of Villa Giusti on 3 November 1918, the fate of the Austro-Hungarian Monarchy was sealed. On 11 November 1918 Emperor Charles I of Austria officially declared to "relinquish every participation in the administration", one day later the provisional assembly declared German-Austria a democratic republic and part of the German Republic. However, on the territory of the Cisleithanian ("Austrian") half of the former empire, the newly established states of Czechoslovakia, Poland, and the Yugoslav Kingdom of Serbs, Croats and Slovenes (the "successor states") had been proclaimed. Moreover, South Tyrol and Trentino were occupied by Italian forces and Yugoslav troops entered the former Duchy of Carinthia, leading to violent fights. An Austrian Constitutional Assembly election was held on 16 February 1919. The Assembly re-elected Karl Renner state chancellor and enacted the Habsburg Law concerning the banishment of the House of Lorraine. When Chancellor Renner arrived at Saint-Germain in May 1919, he and the Austrian delegation found themselves excluded from the negotiations led by French Prime Minister Georges Clemenceau. Upon an Allied ultimatum, Renner signed the treaty on 10 September. 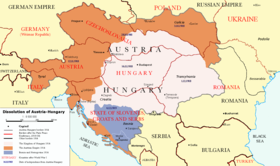 The Treaty of Trianon in June 1920 between Hungary and the Allies completed the disposition of the former Dual Monarchy. The treaty declared that the Austro-Hungarian Empire was to be dissolved. According to article 177 Austria, along with the other Central Powers, accepted responsibility for starting the war. The new Republic of Austria, consisting of most of the German-speaking Danubian and Alpine provinces in former Cisleithania, recognized the independence of Hungary, Czechoslovakia, Poland, and the Kingdom of Slovenes, Croats and Serbs. The treaty included 'war reparations' of large sums of money, directed towards the Allies. The Lands of the Bohemian Crown, i.e. the Bohemia and Moravia crownlands (including small adjacent Lower Austrian territories around Feldsberg and Gmünd) formed the core of the newly created state of Czechoslovakia. The Austrian Silesia province upon the Polish–Czechoslovak War of January 1919 was split between Czech Silesia and Polish Cieszyn Silesia incorporated into Silesian Voivodeship. These cessions concerned a large German-speaking population in German Bohemia and Sudetenland. The former Kingdom of Galicia and Lodomeria, made up of the territory the Habsburg Monarchy had annexed in the 1772 First Partition of Poland, fell back to the re-established Polish Republic. The adjacent Bukovina in the east passed to the Kingdom of Romania. The southern half of the former Tyrolean crownland up to the Brenner Pass, including predominantly German-speaking South Tyrol and the present-day Trentino province, together with the Carinthian Canal Valley around Tarvisio fell to Italy, as well as the Austrian Littoral (Gorizia and Gradisca, the Imperial Free City of Trieste and the March of Istria) and several Dalmatian islands, as stipulated by the 1915 London Pact. The main part of the former Kingdom of Dalmatia, the Duchy of Carniola and Lower Styria with the Carinthian Meža Valley and Jezersko was ceded to the Yugoslav Kingdom of Serbs, Croats and Slovenes, contrary to what was stipulated by the 1915 London Pact. Also Bosnia and Herzegovina was given to it. Austria-Hungary's only overseas possession, its concession in Tianjin, was turned over to China. Burgenland, i.e. the predominantly German-speaking western parts of the Hungarian counties of Moson, Sopron and Vas, were awarded to Austria. The affiliation of the Southern Carinthian territory with its Slovene-speaking share of population was to be decided in a Carinthian Plebiscite. In nearly all of these cases, the Allies not only assumed without question that the minority peoples wanted to leave Austria, but allowed the successor states to absorb significant blocks of German-speaking territory. In addition, it is arguable that the negotiators on the Allied side, particularly Wilson, did not understand, when speaking of self-determination, that no convenient line could be drawn to separate intermingled nationalities, and that in further cases, irredentists would claim that some German or Hungarian-speaking territories had actually been theirs all along and even go as far as inventing place names to prove it, to wit the South Tyrol. Article 88 of the treaty required Austria to refrain from directly or indirectly compromising its independence, which meant that Austria could not enter into political or economic union with the German Reich without the agreement of the council of the League of Nations. Accordingly, the new republic's initial self-chosen name of German-Austria (German: Deutschösterreich) had to be changed to Austria. Many Austrians would come to find this term harsh (especially among the Austrian Germans who were German nationalists of the former Austro-Hungarian Empire), due to Austria's later economic weakness, which was caused by loss of land. The economic weakness of Austria would later lead to support for the idea of Anschluss (political union) with Nazi Germany. Conscription was abolished and the Austrian Army was limited to a force of 30,000 volunteers. There were numerous provisions dealing with Danubian navigation, the transfer of railways, and other details involved in the breakup of a great empire into several small independent states. The vast reduction of population, territory and resources of the new Austria relative to the old empire wreaked havoc on the economy of the old nation, most notably in Vienna, an imperial capital now without an empire to support it. For a time, the country's very unity was called into question. Unlike its former Hungarian partner, Austria had never been a nation in the true sense of the word. While the Austrian state had existed in one form or another for over 700 years, it had no unifying force other than loyalty to the Habsburgs. This page is based on the Wikipedia article Treaty of Saint-Germain-en-Laye (1919); it is used under the Creative Commons Attribution-ShareAlike 3.0 Unported License (CC-BY-SA). You may redistribute it, verbatim or modified, providing that you comply with the terms of the CC-BY-SA.